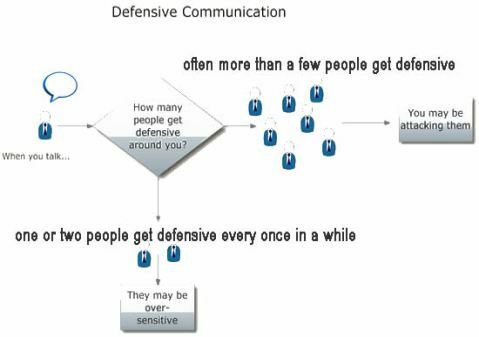 Is defensive communication necessary? Only when aggressive communication is taking place. Defensive communication is counterproductive when no harm is intended. You need to be able to figure out if there is true aggression and avoid reacting defensively when there is none. Being overly defensive is a problem that needs to be dealt with separately. This page is focused on real attacks, not perceived. Ideally, even when we are attacked, we would not get defensive, we would not let offensive comments or verbal attacks get to us. But even if we don’t let stuff get to us, we still need to stop people’s attacks, before they get out of hand. Verbal aggression may be hidden or direct. When a person attacks you directly, they let you know in no uncertain terms that they are upset and that you are the cause of it. When a person attacks you indirectly, they use ambiguous language that it’s intended for you but doesn’t appear that way. When you react defensively to the language, the attacker acts surprised you are so sensitive and that you are taking things personally. Supervisor: The assignment was due today, why haven’t you completed it? Employee: I didn’t have time; I have been working on the payroll system problem that needed to be fixed right away. Supervisor (getting red and pounding on the desk): You never meet your deadlines! You don’t know how to multitask; you need to get your act together or you are not going to make it here. Supervisor (grinning): Everybody has an excuse. Some people just don’t know how to complete work on time. In the examples above, the supervisor failed to give corrective feedback in an appropriate way, which would include letting the employee know the consequences of not getting his work done on time and ways to deal with similar problems in the future. Supervisor: The assignment is due today, is it complete? Employee: I didn’t have time to complete it; I have been working on the payroll system problem that needed to be fixed right away. Supervisor (with serious face):I understand the payroll problem had to be fixed, but I was counting on you to finish the report I asked you to complete by today. Not having it means we will not be able to secure funding for project xyz. We can’t let this happen again. Next time you find that you won’t be able to meet a critical deadline because of another high priority competing project, let me know right away so we can work out the priorities or get someone else to help get both projects done. Not all managers will have the patience to contain their frustration and give you the right feedback, the right way. Managers face their own pressures being accountable to their boss. You may need to use defensive communication to deal with other people’s frustration that can show as a direct or indirect attack. Whether the verbal aggression is direct or indirect, you need to deal with it before it becomes the predominant dynamic in a work relationship: before you become a punching bag, so to speak. The easiest way to avoid getting defensive is to be present to your thoughts when you are under attack. You need to witness your thinking process to determine what thoughts are triggering feelings of defensiveness. I used to get defensive when people told me that I didn’t know “my numbers” (meaning my department budget numbers). I was unaware that the thoughts going through my head were creating a lot of noise “Oh my God, I just don’t seem to remember numbers”;, “Why can’t I remember figures? They are so important to my job”;, “But I still do a good job!” “Who needs numbers anyway?” As much as I tried to remain calm, I couldn’t. I would get defensive and even start telling people that remembering numbers was not so critical, that I could always bring them with me on paper or a laptop. As I practiced mindfulness and became more aware of the thoughts that were triggering my defensiveness, my mind calmed down and I could focus on the questions and getting the numbers ready and available to further the discussion. Each person has different thoughts that cause defensiveness, make a point to find out what yours are so you can manage them. The next step in defensive communication is to learn to recognize verbal attacks, especially the hidden ones. Get familiar with phrases that may hide an attack so you can recognize them and deal with them on the spot. Another way to recognize a veiled verbal attack is to observe your own reactions. If you have a negative gut reaction to something that it's said, look for the hidden message and distinguish if the speaker is attacking, or you're being oversensitive. The third and last step is to address the verbal attack in an objective way until the attacker also calms down. If the attacker has been calm all along, it’s likely you're dealing with a workplace bully, in which case the situation calls for more drastic corrective measures. Dealing with a workplace bully is not easy but it’s doable. Many of the same principles of defensive communication apply when dealing with workplace bullies: Remain calm, observe and listen, then react with professionalism and objectivity. If the verbal abuse continues, escalate the problem to HR or the bully’s manager. Keep in mind that aggression, either direct or passive, represents an inability to communicate assertively. Behind the aggression are the aggressor's unmet needs that he or she can't express clearly and directly. This lack of assertiveness is one of the reasons why people bully at work. Do other people get defensive when you talk? If you're causing others to engage in defensive communication, you're either attacking them, or they're being oversensitive. The chart below can help you determine if you or them are the cause of their defensiveness. If several people get defensive with you, it's likely you're attacking them, directly or in a hidden way. You may want to practice a direct and yet caring way of asserting your needs. If the defensiveness shows up only with one or two individuals, then it may be their problem to solve, not yours. You may still want to find out what their buttons are and stay clear from pushing them. Defensive communication is only necessary to help us identify patterns of communication that are unhealthy. In the end, avoiding defensiveness is just a good practice toward improving communication.